Trey Sellars (Eddie Murphy) wants to be a star. He is an actor who survives through his day job – he’s a cop because he was not coordinated enough to be a waiter. Chase Renzi (Rene Russo) is a television executive who is looking for a new reality show to wow the world. 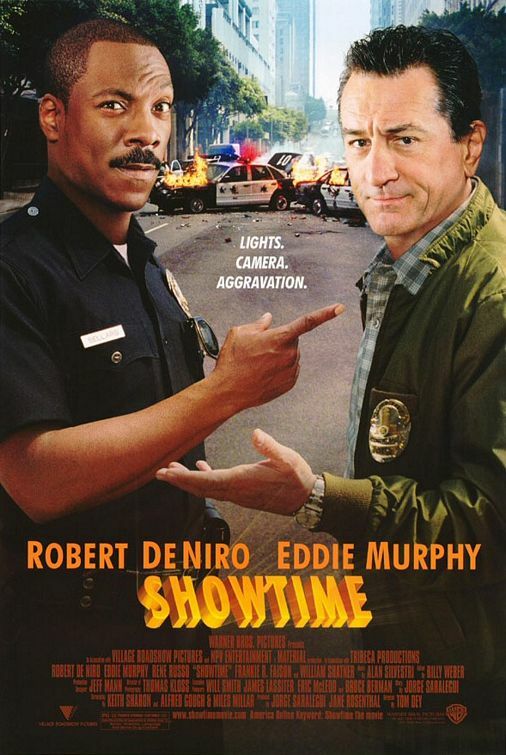 After Sellars botches the drug raid of Detective Mitch Preston (Robert Di Niro), Preston is strong armed into appearing on a police reality television show, Showtime. Preston and Sellars are the typical unlikely buddy cop pairing, attempting to solve the mystery of some new super-guns whilst constantly being followed by cameramen. There is something about this film that looks as though it should be awful. However, it’s actually extremely funny. Robert Di Niro is doing comedy, but he is playing the grumpy straight man and this works beautifully. Eddie Murphy is, as pretty much always wonderful. The pairing works well, the plot is almost feasible and it’s a surprisingly good film. Definitely worth a trip to the DVD shop. Oh, and William Shatner’s in it.